It's my job to spend the day cooking and talking about food – and I know you like to too! Whether you're a novice cook or an experienced home chef, this is your chance to talk with me in the kitchen. Don't let cooking dilemmas or ingredient conundrums hold you back. Let's talk about Living Your Life Deliciously...Ask Tara! Search for questions and answers! General questions and answers of how to work your way around the kitchen as well as questions about Tara! Ingredient recommendations, favorite foods, and preferred tools! Preparation and cooking tips and tricks that make cooking that much more enjoyable. Is there a food you can’t bring yourself to eat? Ohhh a can of worms! I mean, I wouldn’t eat a can of worms, that’s for sure, but that is to say I’m a very picky eater, so that is quite a question! Have been since childhood! How I made my career in food is beyond me. Yes, I can’t, not just won’t, eat shellfish (especially mussels, oysters and clams). Also on that list would be offal (animal organs). There’s a reason it’s named offal! LOL. How long can I freeze cookie dough? Who has leftover cookie dough? LOL! I freeze mine for up to a month. That being said, some freezers are better (or worse) than mine. If you’re freezer is a super star and has no tendency to freezer-burn things, it can be frozen up to 3 months. Also wrap it well so it doesn’t take on other flavors from the freezer. What is something you would rather eat in a restaurant than make at home? Anything deep fried! Also fish. Oh my goodness I love fish but I use a full bottle of Fabreeze in the house when I cook it at home. I love grilling fish on the bbq outside though. Bring on summer! Why do some recipes call for eggs to be room temperature before using them when baking? When baking you want all of your ingredients at the same temperature. This allows them all to mix evenly and distribute well. For example if you were making a cake with butter, eggs and maybe some milk or buttermilk, you’d cream the butter then add the eggs. If your butter had been perfectly softened to room temperature and you add cold eggs, your butter would immediately clump and not disperse in the mixture as evenly. Same with adding cold milk at the end of mixing your batter–it would be wonderfully mixed and then cold milk would seize all those other ingredients into tiny clumps that might create funny air pockets in your baked goods. To quickly bring eggs to room temperature I put them in a bowl of warm water for several minutes before using them in a recipe. Some recipes say to bake squash facing up, others say to bake squash facing down. Does it really make a difference in the end result? It depends on what you are using the squash for and the needs of your recipe. If you slice a squash like butternut, acorn or spaghetti squash in half and then place it face down on a baking sheet to roast, you will essentially be steaming the insides. The steam is trapped in the cavity of the squash. This is great if you want the insides soft and spoonable, or if you need to cook it a little faster. Roasting the halves cut-side up cooks the insides without intense steam. You may get some nice caramelization on the surface, and these halves will be a bit more sturdy when tender instead of super soft. You can use that method if you want to stuff the squash halves and serve them whole, or if you’d like to peel the skin and use chunks of squash in a recipe instead of a soft, spoonable situation. 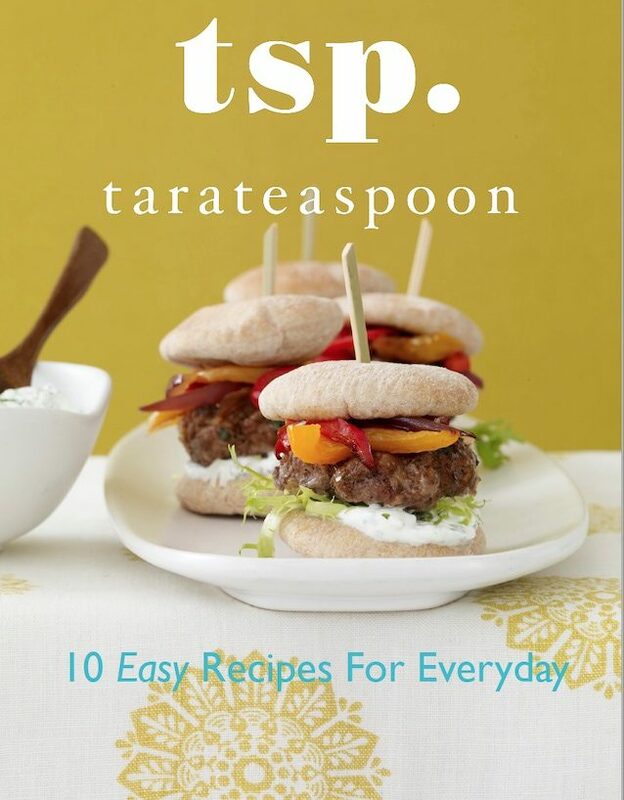 How did you come up with your name, “Tara Teaspoon”? I had a friend a long time ago that said, because I cook, she was going to call me Tara Teaspoon, because I was too small to be called Tara Tablespoon. It didn’t stick until years later when I was trying to come up with a name for my company. Now people call me that all the time! Feel free to do the same! What is your favorite go-to ingredient? Cheese! I had to think about that, but I find I consider what kind of cheese is in the fridge when I start a meal, or snack for that matter. Sometimes I’ll start a recipe with it, sometimes I finish it with a dash of Parmesan. If you know me, you know I have nachos for dinner more nights than I’d like to admit. I love cheese on toast in the mornings and cheese in my salads. Please never ask me to be vegan. What food is your guilty pleasure? Croissants. Plain or chocolate, I’m not picky when it comes to my guilty pleasure. Do you prefer stainless steel or nonstick cookware? I use both, and prefer one kind over the other only when it’s needed for the recipe. Stainless cookware (and I prefer tri-ply or clad, heavy duty pans) is great for sautéing when I want to make a sauce out of the little caramelized bits on the bottom of the pan, or transfer the entire pan to the oven to finish cooking the food. It’s also my favorite for saucepans because I feel like I can stir and whisk in the pan without worrying about destroying a non-stick surface. Non-stick cookware (skillets really) are what I grab when I’m doing a quick saute or browning, making grilled cheese, crisping garlic or pan-frying my dumplings. I prefer ceramic-coated nonstick, but have no problem with PTFE the traditional coating. However, once there are scratches on my non-stick pans I quickly replace them and suggest you do the same. I waste so much food after buying specific ingredients for a recipe, but don’t use everything. Any tips on how to make a meal come together with random ingredients? Don’t be scared to experiment! I also like to start my clean-out-the-fridge dinners with pasta or a healthy grain. Could those ingredients be tossed with pasta, roasted and stirred into a grain salad? This covers a lot of herbs and seasonings too! You don’t have to use all your leftover ingredients bits at once either. One could be used on a sandwich for lunch the next day, or maybe an herb gets added to some sautéed veggies at dinner. And if the ingredient is able to be frozen to use later, don’t hesitate. It may be perfect in a soup next month! Which kitchen gadgets can you not live without? My small offset spatulas. My silicone rubber spatulas. A Chef’n citrus juicer and my Oxo garlic press. What is your favorite brand of kitchen knives and why? Kitchen knives should feel good in your hand. Test them out and hold various brands in your hand before buying. I like my Wusthof knives as well as Global. They fit my hand well and the weight is good. How long does cooked rice last in the fridge? It would be fine up to a week. I love freezing my leftover rice, especially sticky rice. Once it’s cooled I put it in zip top freezer bags, press the air out and seal. The little bags are ready to dump into a bowl or pan to re-heat later. These bags are fine in the freezer up to 6 weeks. Dear Tara, I love kitchen gadgets, but I’m skeptical to buy them because they often end up in my graveyard of unused kitchen tools. Should I buy an Instant Pot? What about one of those sous-vide cookers? I feel like they’re good tools, but maybe I’d use them once or twice and then set them aside only to collect dust. Are there any gadgets you consider must-haves? I do too! And I’m like you and live in a small apartment with a small kitchen. In fact in my last apartment I stored my must-have salad spinner in my bedroom closet! Now it has a home in my slightly bigger space, but I feel your pain. Buying new kitchen gadgets or small appliances depends completely on your lifestyle, how you cook and what you cook. That being said, if you find a kitchen tool has resided in your drawer graveyard for a while, it’s time to just get rid of it. Knowing you didn’t use it will help you determine what gadgets and tools you might like in the future. If you use your slow cooker a lot, and find you would prefer your meals cooked in a shorter amount of time I suggest getting an Instant Pot. A sous-vide appliance is very specialty and would be for someone who likes to fiddle and play in the kitchen rather than get down to the business of weeknight dinners! With any small appliace or gadget there will be a learning curve. When to pull it out and use it, learning a new style of cooking (read Instant Pot), and determining if it’s a fit for your kitchen. I couldn’t live without my powerful blender, my food processor, mandolin and popcorn maker. I could go on, but kitchen equipment is my life! Why is it suggested that mushrooms be cleaned off with a wet paper towel instead of rinsing them off under running water? Mushrooms are like little sponges! Rinsing them in water, or worse, soaking them in a bowl of water, just gives them a chance to drink up excess water like a dry dish sponge would. Because mushrooms already have a lot of water in their makeup, you typically give the moisture time to cook off, or add less liquid to a recipe if it’s being baked with mushrooms. Rinsing them in water simply adds more, which in most cases we don’t want! What is your best tip for a beginner cook? Learn and practice knife skills. That’s all. When you have great knife skills you enjoy cooking more. When you enjoy cooking more you become confident and successful in the kitchen. Have a question? Tara would love to hear from you. Fill out the form below to submit a question.